Tablets and smartphones are in, but don't count laptops out. Impressive new laptops planned for 2012 promise to be thinner, lighter, and faster, as well as to carry longer-lasting batteries. All the pieces are in place for a surge in laptop sales next year, from new Intel chips to the planned launch of Windows 8 to sleeker designs. You may be in the market for a new laptop this holiday season--or you might find that sticking with what you have and upgrading next year makes more sense, considering the hot models that are sure to be announced at the annual CES trade show in January, as well as the new technology on the horizon. Here's what to expect in the coming year. Thin and lightweight Ultrabooks are the watchword, thanks to Intel, which has trademarked the name for a new category of ultraportable laptops. 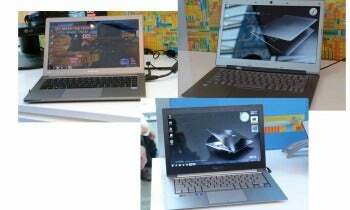 By some predictions, as many as 30 to 50 Ultrabook models will be announced at CES. For a laptop to qualify for the label, it must be less than 21mm (0.83 inch) thick, resume from hibernate to keyboard input in less than 7 seconds, get at least 5 hours of battery life, and support certain specific Intel security features in the BIOS. We have already reviewed four Ultrabooks: the Acer Aspire S3, Asus Zenbook UX31E, Lenovo IdeaPad U300s, and Toshiba Portege Z835. A fifth, the HP Folio 13, will soon be released. You'll notice some major brands missing from that list, such as Dell, Samsung, and Sony; you can probably expect to see Ultrabooks from those manufacturers in the first few months of 2012. The category will kick into high gear when Intel’s next-generation CPUs, code-named Ivy Bridge, hit the market. Ivy Bridge's power utilization and performance, together with steadily falling prices on solid-state drives, should make these superthin laptops more affordable and appealing. By the end of the year, we may even see Ultrabooks with screens that rotate and fold down to transform into a tablet. The emphasis on touch interfaces in Windows 8, together with the thinner and lighter design of Ultrabooks, could make this new generation of convertible laptops more desirable than the convertibles of the past few years. The second-generation Intel Core i5 and i7 CPUs in today’s laptops went by the code name Sandy Bridge. That platform's successor is due next year. Ivy Bridge takes the Sandy Bridge architecture (with a few minor tweaks) and shrinks it down from a 32nm manufacturing process to Intel’s new 22nm tri-gate process. It also dumps the Sandy Bridge graphics core in favor of a whole new graphics architecture that runs more quickly, provides better video acceleration, and supports Microsoft's DirectX 11. The bottom line: At the same level of performance, Ivy Bridge chips will utilize significantly less power than their Sandy Bridge counterparts do. That translates into noticeably longer battery life in thin-and-light laptops. And the chips will be faster while consuming the same amount of power, which means that high-power laptops will be even speedier. The new integrated graphics are a bit of a mystery, but a good guess is that you can expect around 50 percent better performance in 3D games. That still isn't enough power to provide great results in many core games, but a lot of titles that were previously unplayable on an integrated-graphics setup will suddenly become bearable. Better yet, those games that barely ran in an acceptable way, such as Minecraft, should run a lot better. Intel has issued no release date for Ivy Bridge just yet. We expect the company to fully unveil the lineup of Ivy Bridge CPU models at CES, together with announcements of support from lots of laptop manufacturers. Actual products will probably start to hit the market at the end of the first quarter or in the second quarter of 2012. What about AMD, you ask? AMD's next Fusion processor, dubbed Trinity, is due around the middle of next year. It takes a modified version of the company’s new Bulldozer architecture and marries that to a big heap of integrated-graphics power. After the very disappointing launch of its desktop Bulldozer processors, AMD has its work cut out for it. Windows 8 changes Windows more profoundly than any release since Windows 95. The new Start screen and Metro-style interface will be contentious, sparking a backlash among some longtime Windows users. Other users will love the fresh new look and feel. Most important, the operating system will undoubtedly inspire a major surge in PC purchases, and an enormous marketing push from Microsoft and its partners. When a new consumer release of Windows hits the market, the whole industry responds. Schedules shift. Deadlines move. New brands launch, and old brands retire. From what we've seen so far, Windows 8 looks to be a much bigger launch than the last few Windows releases, so you can expect a glut of new laptops, desktops, and all-in-ones set to debut together with Microsoft’s new operating system. We don't have a release date right now, but given that Windows 8 hasn't yet had a public beta test and Microsoft's OSs generally take about nine months to go from the first beta to store shelves, you can expect a late-summer or fall release. Windows 8 puts a large emphasis on providing a first-class touch interface, without sacrificing good old-fashioned keyboard and mouse use. That means a better user experience on touchscreen-equipped laptops, so expect to see more of those machines on the market. It will also support ARM-based processors for the first time, so we may even see hybrid laptops that run on a full-power Intel or AMD chip most of the time, but offer a detachable tabletlike display with an ARM processor for those occasions when you need longer battery life and greater portability instead of a keyboard and touchpad. We might even see ultralight laptops powered solely by ARM-based CPUs, though that raises some questions about expectations of software support.